Business Survival Rates – Total BackOffice Solutions, Inc.
We’ve all heard about the high business failure rates, particularly when it comes to new business start-ups. 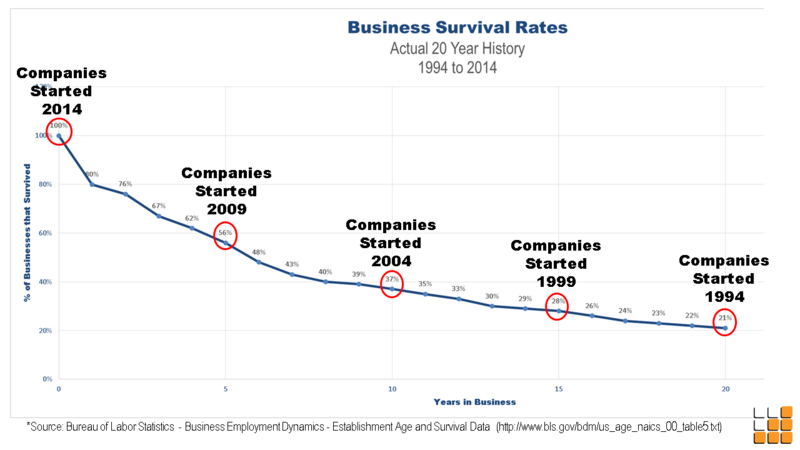 With the economic problems that arose in 2007, I was curious about business survival rates. So, I went to the Bureau of Labor Statistics. I took their multi-page report of raw data (columns of dates and numbers) and after a few steps transformed it into the summary table shown below. Keep in mind that the percentages shown are of companies that are still in business as of March 31 for the years beginning in 1994 to 2014. The USA Today reported in a June 15, 2011 list that showed there were less than 500 Public US companies that had survived 100 years or more in business. There have also been reports that the average lifespan of S&P 500 companies has dropped from about 61 years in 1958 down to about 15 years and falling. The statistics don’t inspire lots of hope. 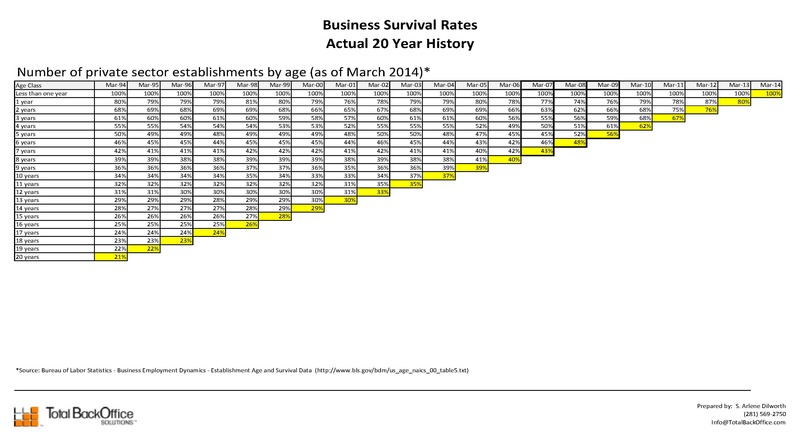 If you are a business owner, you can go to the the first year that you were in business as of March 31st and follow that column down to the last number to discover what percentage of your colleagues were still in business on March 31, 2014. Of course, the survival rates vary by industry and there is lots of data to explore, if you choose to on the Bureau of Labor Statistics website. The bottom line is that business failure rates are high. The odds aren’t stacked in favor of survival and the passage of time doesn’t necessarily work in favor of survival either.